If the next three pages don't convince you that the Ariel Computerized Exercise System is far superior to Cybex and Kin Com, I want to know why. 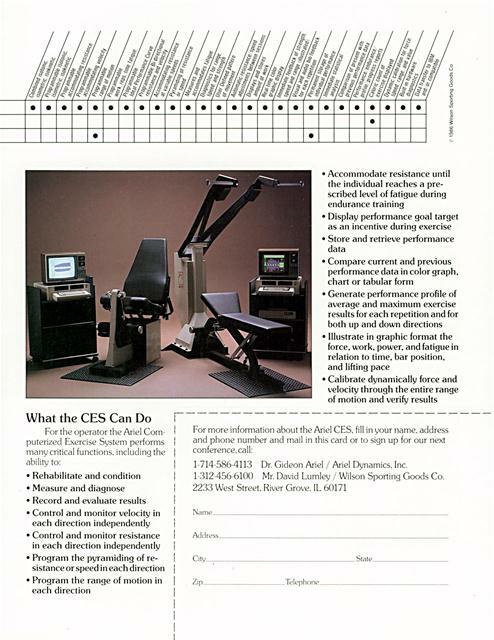 The Ariel Computerized Exercise System (CES), invented by Dr. Gideon Ariel, heralds a new era in physical rehabilitation, research, and conditioning. Ariel CES is the only system available that automatically monitors, controls, and modifies resistance and velocity while the person is exercising. It does this safely and efficiently, constantly adjusting itself to accommodate each person's unique capabilities or limitations. Ariel CES also provides extensive and accurate measurements of movement, strength, and endurance with the capability for storage and subsequent comparison and analysis of the individual's performance. "That's why we call it the "Intelligent System" for rehabilitation and fitness. Arid CES senses and responds directly to an individual's performance in real time. In other words, the computer is able to control your movement and adjusts to your effort while you exercise. Not only does the Ariel CES sense and respond to specific motions, it also interacts with the individual, providing immediate visual and audio feedback during exercise. 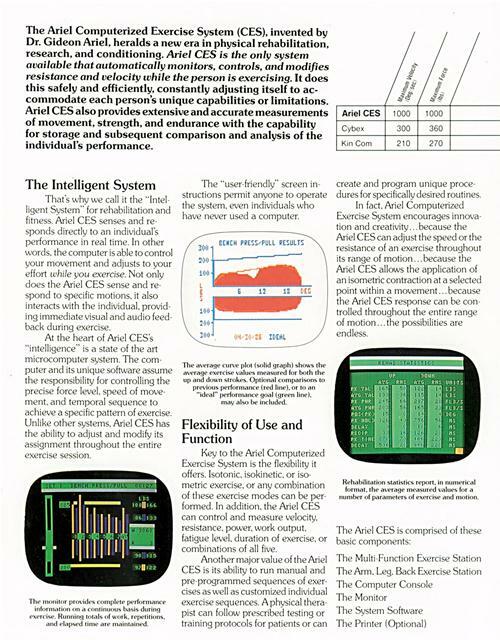 At the heart of Arid CES's "intelligence" is a state of the art microcomputer system. The computer and its unique software assume the responsibility for controlling the precise force level, speed of movement. and temporal sequence to achieve a specific pattern of exercise. Unlike other systems. Arid CES has the ability to adjust and modify its assignment throughout the entire exercise session. The monitor provides complete performanceinformation on a continuous basis duringexercise. llmuting totals of work. repetitions.and elapsed tint' are maintained. The "user-friendly" screen instructions permit anyone to operate the system. even individuals who have never used a computer. The average curve plot (solid graph) shows theaverage exercise values measured for both theup and down strokes. Optional comparisons toprevious performance (red line), or to an"ideal" performance goal (gre(,n line).may also he included. Key to the Ariel Computerized Exercise System is the flexibility it offers. Isotonic. isokinetic. or isometric exercise, or any combination of these exercise modes can be performed. In addition, the Ariel CES can control and measure velocity. resistance, power. work output, fatigue level, duration of exercise. or combinations of all five. Another major value of the Ariel CES is its ability to run manual and pre-programmed sequences of exercises as well as customized individual exercise sequences. A physical therapist can follow prescribed testing or training protocols for patients or can create and program unique procedures for specifically desired routines. In fact, Ariel Computerized Exercise System encourages innovation and creativity ... because the Ariel CES can adjust the speed or the resistance of an exercise throughout its range of motion ...because the Ariel CES allows the application of an isometric contraction at a selected point within a movement ... because the Ariel CES response can be controlled throughout the entire range of motion ... the possibilities are endless. Rehabilitation statistics report. in numerical format, the average measured values for a number of parameters of exercise and notion. Ariel Dynamics. Inc. was founded in 1968 by Dr. Gideon Ariel. a world renowned authority in biomechanics. He has been the driving force behind 18 years of research and development leading to the Ariel CES. Ariel completed his graduate and post-doctoral work at the University of Massachusetts. He holds a Ph.D in Exercise and Computer Science, has published many scientific papers. holds patents on several devices, founded and chaired the Biomechanics Committee of the U.S. Olympic Committee. and has served as consultant to many of the country's leading companies and organizations including IBM and NASA. Wilson Sporting Goods Ci I . t worldwide leader in the manuf.t, ture of equipment for golf. racl., ï¿½t sports and team sports. 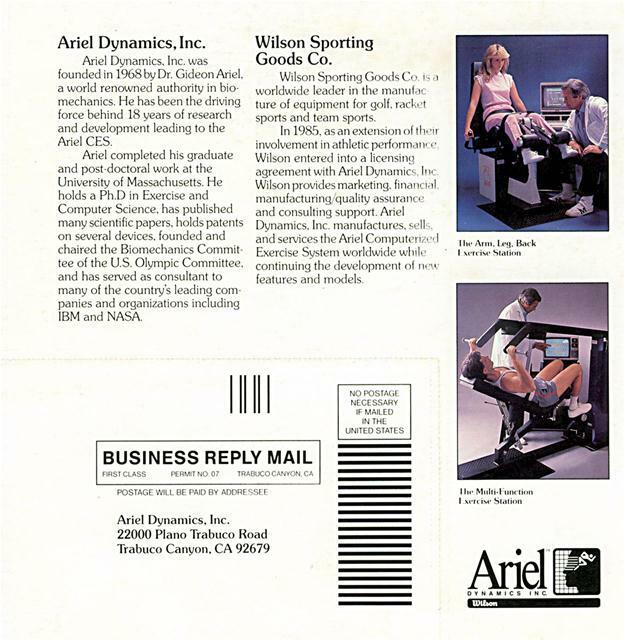 In 1985. as an extension of IIr'n involvement in athletic perform, nl Wilson entered into a licensintt agreement with Ariel Dynamic Ill. Wilson provides marketing. final ici;il manufacturing quality assuran( and consulting support. Arid Dynamics. Inc. manufactures. Generated on 4/24/2019 9:01:08 AM (PST) ADI/HQ/GBA/2019/ARIELCLOUD/v3.0.2018.0126.